Delight all of your senses with the sights and sounds of local artists while sampling culinary treats at various downtown venues. Entertainment by Barbara Ingram School for the Arts students & other talented local artists. Get your passport ticket stamped at every venue and be eligible to win a variety of prizes! Bring your stamped passport to the Washington County Arts Council when completed visits at all venues. Tickets sold at The Maryland Theatre box office and all venues are within walking distance of City Center. 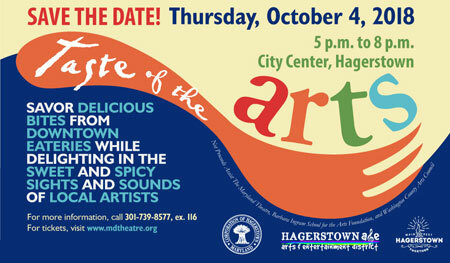 Taste of the Arts benefits The Maryland Theatre, Barbara Ingram School for the Arts Foundation, and Washington County Arts Council. Sibara is a vibrant oasis on East Franklin Street. Warm vibes, tantalizing aromas, and sounds of jazz embrace you as you enter this intimate restaurant in downtown Hagerstown. Restaurateurs Wilson and Katlego Sibara hail from South Africa by way of Montgomery County, MD, and have brought the tastes of cultural diversity to the New Hub City. A vibrant hangout in Hagerstown's downtown district offering great food, drinks, whiskeys, and music, from jazz on Thursdays to open mic on Fridays to mainline bands on Saturdays.The Broad Axe is a place to stop after work to unwind after the day or bring your friends and loved-ones to have a great meal. World famous cheesesteaks and authentic New York style pizza, dedicated to providing customers with high quality ingredients and overstuffed portions. A classic American ale house, boasting 20 beers on tap, upscale bar fare, and a back porch for those warm summer nights. Pretzel-centric eats, sandwiches, and pizzas, plus full bar and coffee bar. Everything is fresh and made to order, including the dough from a hand-blended menu. Local, Fresh, Affordable. 28 South is a contemporary American restaurant where our chefs find fresh, local ingredients for an exceptional dining experience. Hagerstown’s new one-of-a-kind literary café and piano bar featuring a creative atmosphere, friendly and playful servers, and an odyssey of new things to taste, hear, learn, and discover. Join us for cocktails, jazz, and stories! American cuisine in a New York style atmosphere. When you enter our establishment, you will feel as if you were transported to Old Bavaria. Inside you will see servers wearing traditional dirndls, memorabilia from Germany, beer steins hanging from the ceiling, all in a friendly setting from which we derived our name Schmankerl (meaning Bavarian culinary delicacy) and Stube (meaning a cozy room). Pork shanks, hot apple-flavored red cabbage, dumplings, roasts, potato salad, and spätzle are all found on our menu filled with classic hearty cuisine of Old Bavaria. Opening reception for Dirt, a collection of photography, illustration, collage, prints, and paintings by a group of young artists self-publishing a zine. Proudly serving desserts from The Gourmet Goat (lunch, tapas, dinner, and martinis at 41 N. Potomac St., TheGourmetGoat.com) and Rhubarb House (quaint and cozy restaurant offering traditional American meals, plus beer, wine & liquor). Window of 43-45 S. Potomac St.